This is about as bad as it got, going through utter hell on the Port de Bales. This was where I was just clinging on grimly and trying to get over this one without losing the plot. I think this was about 5km from the top so 15km into it. I’ve finally got my pics back and they look brilliant. I’ve stuck them on my flickr account so if you just click on this one you’ll be able to find the rest. Timely to see how I suffered after watching Vino ride like a Kazakh warrior today to take the stage. There was something about his attacking and determination not to be broken that really made me feel some proximity to him. And they be pumped his fist, zipped up his jersey and threw his arms wide open as he crossed the line. It really brought a tear to my eye to know how it feels. 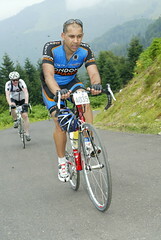 This entry was posted in 2007, Etape du Tour and tagged 2007, Etape du Tour, Foix, Loudenvielle. Bookmark the permalink.